We hope everyone had a safe and good Memorial Day Weekend. We would like to give our Thanks to all the veterans and they're families for their sacrifices and service to our Country. All but one of our Winners of the Fabric Challenge have picked up their prizes. 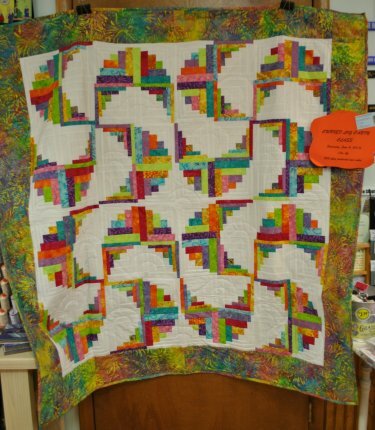 1st Place Winner, Debbie B., received a copy of the newest edition of "The Quilter's Travel Companion". 2nd Place Winner, Lois E., received a fat quarter bundle of Northcott's Shimmer fabrics. We won't announce 3rd Place Winner, Denise A. 's, since she hasn't had a chance to pick up her prize. We don't want to spoil the surprise. Congratulations to all of our participants! everyone did a fabulous job! I have been a bad puppy this past week. I'm in the dog house. My treats have been rationed. Last Monday, I took off to see the neighbor's dog but forgot I was on my leash. I took Mom with me and hurt her elbow pretty badly. Then, after she got back home from the ER, I went and rolled in a dead animal. THAT was not my smartest move, either. I have proceeded to find and roll in dead things on several occasions since then. Mom has figured out how to wash dogs one-handed very well. I have had 4 baths since last Monday. I am a very clean dog. Since Mom isn't able to do much, we weeded the garden out in the backyard of the Shop. She did ask me NOT to water the plants while she is weeding around them. I was just trying to help & mark my territory. It wasn't that big of a deal. So, when you come into the Shop, you know why Mom's arm is in a sling. I'm still here, so, I figure she still loves me. I've been really good on a leash since then. 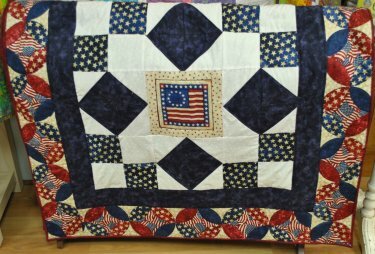 This Saturday, June 4th is the Curvy Log Cabin 10-3 $25 plus material & ruler. It's easier than it looks! Grandma will show you! Saturday, June 11th is Free Pattern & Demo Day! I don't know what Grandma has planned, yet. Coffee, tea, water & people treats are included. If you get full & it's not chocolate, I can help you with your treat. A fun & easy way to incorporate those cool little panels you don't know what to do with. There's still lots of room in this Saturday's class and I heard there's a good chance the garden is going to be too soggy to work in. So, why not come in & take a class? Have a great week! I hope everyone stops in to say "Hello". Keep your eye in the local Penny savers & papers for our ads & sales.